CBS’s Bob Schieffer questioned the administration’s dedication to defeating the Islamic State (IS) during Sunday’s "Face the Nation." Shortly after showing a clip of National Security Adviser Susan Rice downplaying the "existential" threat posed by IS (also known as ISIS or ISIL), Schieffer said, "I don’t think this has anything close to the evil the Nazis represented, and obviously this is not the Cold War with the Soviet Union, but it seems to me this is something that I’m still not sure this administration is galvanized to fight this fight and do what’s necessary to do it." Republican lawmakers echoed Schieffer’s concerns, but Secretary of State John Kerry defended the administration’s strategy, telling NBC’s "Meet the Press" that the United States is "on the road" to defeating the extremist group. "Twenty-two percent of the populated areas that they held have been taken back already, and that's without launching what we would call a major offensive. It's with the efforts of the Iraqi army as it’s being retrained and standing up again to reclaim some territory as they begin to probe. We have taken out a significant proportion of the top leadership of ISIS," Kerry said. "They no longer can communicate the way they were, as openly. They no longer travel in convoys the way they were as openly, or where they do, they're at great risk." However, Kerry admitted the strategy is a long-term effort and more needs to be done. "There's a lot more to do," he said. "We have said since the beginning this is a long-term operation, not a short-term one, but we believe everything, including the governing process in Iraq itself, is moving in the right direction." To date, the United States and its coalition partners have carried out roughly 1,600 airstrikes in Iraq and Syria. Republicans say it’s insufficient to defeat a group that, they believe, poses an immediate and growing threat to the United States. 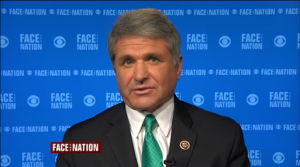 Rep. Michael McCaul (R., Texas) told CBS the administration does not take the threat seriously enough and "they never have." "They won't even define the enemy for what it is, radical Islamist extremism. I believe the airstrikes have been limited, [and] had limited success. It’s a policy of containment, not a policy to degrade and destroy the enemy." McCaul said it was his hope that the latest instance of ISIS’s brutality, seen in the murder of Jordanian pilot Lt. Muath al- Kaseasbeh, will encourage more Arab nations to fight. "If anything the lighting on fire of this Jordanian pilot will now galvanize, I hope, the Arab nations to fight ISIS, including on the ground," McCaul said. "I think that under U.S. leadership if we can galvanize these Arab nation, Sunni Arabs against Sunni extremist, ISIS, in Syria that would be the ideal … the airstrikes are not sufficient to date to take care and take out ISIS right now."